Jacob Wessels, an undergraduate in EEB working in the Fitzpatrick Lab, is focused on the population ecology of the nonnative Mediterranean geckos, which have established populations throughout much of the southern United States and have been expanding their range northward largely through unintentional transport by people. Recently, a population was discovered in Knoxville, which is the edge of the range of these Mediterranean geckos. Wessels and a fellow student observed the population size and trend and monitored it to see if they would survive the winter. Using pattern recognition software and the unique dorsal patterns of individual geckos, Wessels established an encounter history. The geckos survived the winter and successfully reproduced, and the model results indicate the population size likely increased. One of his current interests is avian migration ecology. 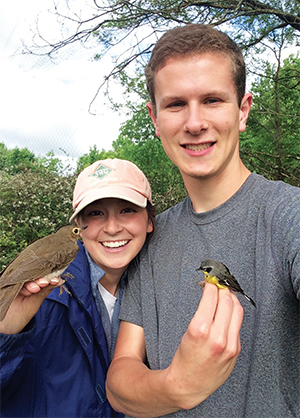 Directly following his final semester, Wessels took a seasonal field tech position in Minnesota examining migration ecology of Golden-winged and Blue-winged warblers. “I am excited to continue gaining experience in this area of study and think my time in EEB has given me a solid foundation of knowledge and experience,” says Wessels.